With unc ompromising faith in the Lord’s power, and rock-solid conviction in the eternal relevance of the scriptures, our Acharya – Swami Abhedananda is a shining example of selfless service and devotion. Immensely blessed by Pujya Gurudev Swami Chinmayananda and Guruji Swami Tejomayananda, he exhibits a rare combination of love & detachment, knowledge & devotion, poise & dynamism. Swami Abhedananda’s thirst for knowledge and inclination towards the depth of Hindu scriptures was spurred very early in his young days, when he was greatly inspired by the discourses and books of Pujya Gurudev Swami Chinmayananda. 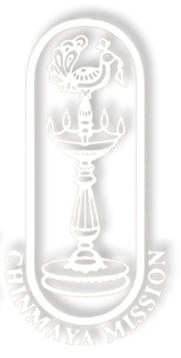 As a young and inquiring student of Hindu philosophy, Swami Abhedananda joined the Vedanta Course in Chinmaya Sandeepany Sadhanalaya, Mumbai, in 1993, where he pursued his intense studies of the scriptures and several spiritual texts. 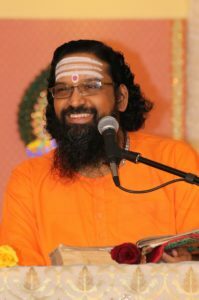 Presently the Acharya of Chinmaya Mission South Africa, Swamiji served as the Acharya of several Chinmaya Mission centres in the past including those in Singapore and India. A naturally gifted speaker and deep thinker, Swami Abhedananda has a beaming spiritual personality that draws every intellectual seeker. He communicates the deepest principles in a simple yet profound manner. Every satsang of Swamiji is a flight to self-discovery, a journey towards uniting with the inner source. In every interaction, Swamiji sprinkles spiritual wisdom through which life becomes simpler, perspectives get clearer, and actions become nobler. Endowed with vast intellectual depth and devotional zeal, Swami Abhedananda is a unique spiritual master who has earned the respect of audiences around the world for his clarity of thought and enamouring knowledge. Exuding love, compassion and clarity, Swamiji has touched innumerable lives and ignited the flame of spiritual seeking in countless hearts. It was in June 2006, that Swami Abhedananda arrived as the Acharya of Chinmaya Mission South Africa. Ever since, with Swamiji’s rejuvenating presence, the missionary zeal in the ashram has grown manifold. With Swamiji’s vibrant presence, the Durban Chinmaya Mission centre has become a powerhouse of knowledge, satsang and love. People flock to the ashram to listen to his discourses and get captivated with the depth of knowledge which flows through him. In a short time, Mission has witnessed many gyan yagnas, residential camps, public talks and mega events like the Mega-Mahashivaratri, 108 Cosmic Hanuman Havan, Chinmaya Shivam Cultural evening, and numerous others. 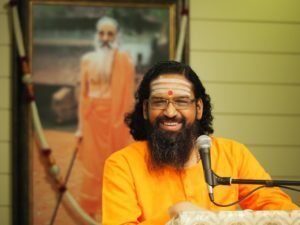 Besides Durban, Swamiji has also been travelling to other parts of South Africa including Johannesburg, Cape Town, Pietermaritzburg and others. The pinnacle point in Swamiji’s two decades of stellar service unto His Guru, has been the conducting of a full time Two Year Residential Vedanta course in Durban. Covering the unfathomable depths of the scriptures, Swami Abhedananda has been imparting this precious knowledge to over twenty full time students through his unrelenting commitment towards teaching in the ancient Gurukul tradition. May Pujya Gurudev keep on expressing through Swamiji’s life and words.